Evaluation of climate change communication – Zion Klos, Ph.D.
Kemp, K., Blades, J., Klos, P. Z., Tinkham, W., Hall, T. E., Force, J. E., Morgan, P. (). Managing for climate change on federal lands of the western US: Perceived usefulness of climate science, effectiveness of adaptation strategies, and barriers to implementation. Ecology and Society. Recent mandates in the United States require federal agencies to incorporate climate change science into land management planning efforts. These mandates target possible adaptation and mitigation strategies. Yet, the degree to which climate change is actively being considered in agency planning and management decisions is largely unknown. We explored the usefulness of climate change science for federal resource managers, focusing on the efficacy of potential adaptation strategies and barriers limiting the use of climate change science in adaptation efforts. Our study was conducted in the northern Rocky Mountains region of the western U.S, where we interacted with 77 U.S. Forest Service and Bureau of Land Management personnel through surveys, semi–structured interviews, and four collaborative workshops at locations across Idaho and Montana. We used a mixed-methods approach to evaluate managers’ perceptions about adapting to and mitigating for climate change. Although resource managers are using language about climate change in regional and landscape-level planning documents, they are currently not planning on-the-ground adaptation or mitigation projects. However, managers felt that their organizations were most likely to use existing management strategies that are already widely implemented for other non-climate related management goals to adapt to climate change. These existing strategies (e.g., thinning, prescribed burning) are perceived as more feasible than new climate-specific methods (e.g. assisted migration) because they already have public and agency support, accomplish multiple goals, and require less anticipation of the future timing and probability of climate change impacts. Participants reported that the most common barriers for using climate change information included a lack of management-relevant climate change science, inconsistent agency guidance, and time and resources needed to access, interpret, and apply current climate science information to management plans. Blades, J., Klos, P. Z., Kemp, K., Tinkham, W., Hall, T. E., Force, J. E., Morgan, P. (). Forest managers respond to interdisciplinary climate change science: Unpacking the central constructs and “best-practices” of boundary objects and organizations. Submitted to Forest Ecology and Management. Land managers, policy makers, and community officials lack locally relevant climate change science and are urgently calling for research to inform management decisions. Boundary objects and organizations are useful frameworks for facilitating the transfer of knowledge between researchers and resource managers. 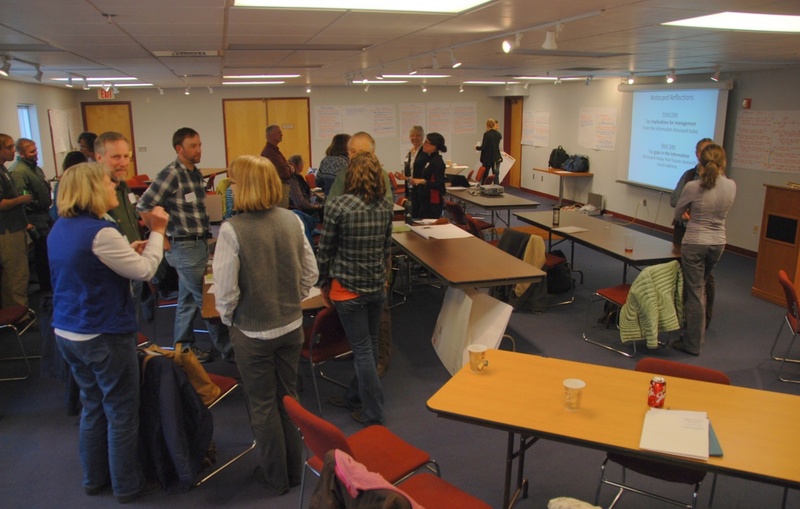 We conducted four climate change workshops in the US northern Rocky Mountains and applied multiple methods of inquiry (pre-post interviews and questionnaires) aimed at contributing to the development of shared operational definitions and a reliable measurement framework for boundary work. We discuss the importance of scale, uncertainty, visualization, and best practices for effective boundary objects and organizations.